The Owls will begin their Spring Football practice activities on Tuesday, March 19th and will continue through Friday, April 20th. The Spring game is slated for Saturday, April 13th at FAU Stadium. Practices are closed to the public, unless otherwise noted. Saturday, March 23 – Third practice and clinic for Miami Dade High School coaches, 11:30 a.m.
Tuesday, March 26 – Fourth practice and Pro Day. Pro Day will be in FAU Stadium at 2 p.m.
Saturday, April 6 – Scrimmage at Miami’s Moore Park, open to the public, 11:30 a.m.
Saturday, April 20 – Final Scrimmage, open to the public and held in FAU Stadium at 11:30 a.m. Note: A clinic for Palm Beach and the state of Florida High School Coaches also will be held. Spread the cheer, life with Lane is back here. Everything's a bit earlier this year except for the Pro Day (3/26, 2 p.m. at FAU Stadium). I'll say now that I'm excited to watch Tronti and Littlejohn take meaningful snaps at QB. There is a 0.00000001 percent chance (some of you know how I am with math) we'll know the winier by the time spring ends, but if they play well or even outplay Robison, it'll make things more interesting. But a FAU QB battle is like MLB free agency: a slog of tweets, more tweets, and speculation. Going to be weird out there now. Already year four for me doing FAU (year three for PBP technically begins this summer) and no Motor, no Azeez, no Soroh or Bain, Buddy is long gone, Willie Wright and his shrugs are already a junior. Big spring for a few names who need to prove themselves before many talented freshmen step on campus. 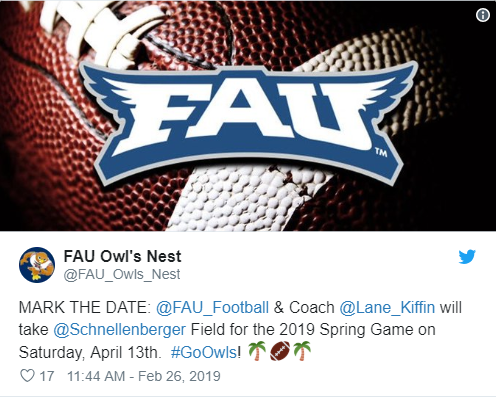 UPDATE: FAU is now saying camp begins on March 19, but the spring game is tentatively scheduled for April 13. So if they stick with the normal format and the spring game is on the 13th, it'd only be practice No. 12. They could have three practices after that, but who knows. Complete Spring Practice Schedule added up top! FAU football team took to the field, one day later than planned due to “mother nature,” but the first day of the 2019 spring season is complete. It was a day for new roles with players rising in class and production expectations. New players were welcomed – both transfers and players walking onto the team – and there were new coaches welcomed to the staff, meaning everyone would be undergoing new evaluations. Florida Atlantic University football has been afforded two outstanding days of weather after shifting practice days due to rain. On Friday morning, the Owls continued to work in shorts and helmets while the temperature was a balmy 72 degrees. Friday’s practice was the second with new coaches, especially on the defensive side of the ball and as the Owls have worked through drills, the comfort level continues to grow. Rashad Smith on is it weird to look around and not see former players who have been here each of his previous two spring seasons. Akileis Leroy on the new coordinators three years in a row. Is it difficult? FAU football got to sleep in a little bit on Saturday with the field workout beginning at 11:30, a time that the Owls are normally wrapping up their weekday practices. From beginning to end, the practice fields were lined with players’ families and South Florida coaches who participated in a coaches’ clinic immediately following the practice. JUCO offensive lineman Lavante Epson was a featured player for today's post-practice interview session. You can read more about him via Shane Marinelli's previous post regarding his commitment. Today's interview was captured via Jake Elman of the Palm Beach Post, and is included below. The team will return to the field this Tuesday and Thursday at 9:30 AM. Practices are closed to the general public. 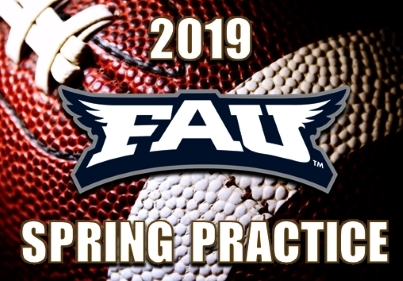 Florida Atlantic University football began the second week of practice Tuesday morning with a traditional practice and then activities moved to FAU Stadium where the outgoing Owls went through the paces of 2019’s Pro Day. It was the first session of the Spring in full pads for the team. Once again, the practice fields were lined with high school coaches and players electing to take in the morning’s football session to learn while on spring break. The team will return to the field this Thursday at 9:30 AM. Practices are closed to the general public. The FAU football team completed their final Thursday March workout under cloudy skies, bits of rain and wind that tested each of the quarterback’s arms. While it is the final Thursday in March, it also was the final Thursday practice that did not have a pre-scrimmage mentality to it. The team will return to the field this Saturday at 11:30 AM. Practices are closed to the general public.